A pentahex is a polyform made by joining five equal regular hexagons edge to edge. 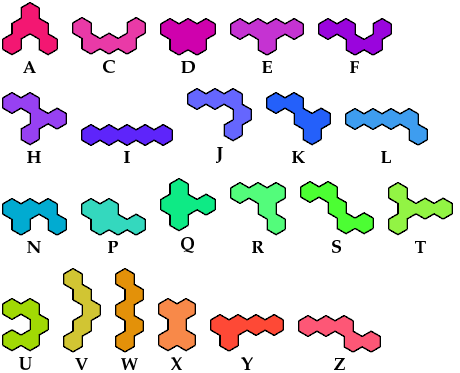 There are 22 pentahexes, ignoring rotations and reflections. 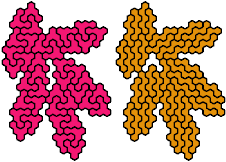 The Yin/Yang problem is to find a holeless polyhex that can be tiled by each of two different pentahexes, leaving a single hole shaped like the other. It was inspired by the corresponding problem of Jenard Cabilao for pentominoes, which you may see (in Flemish) at KSO Glorieux's Pentomino site. Here I show minimal known Yin/Yang solutions for every pair of pentahexes. If you find a smaller solution or solve an unsolved case, please write.